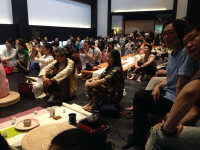 Aplication for hosting a Chinese tea tasting party to discover and experience Chinese premium tea. We would provide a full package of tea set for a Chinese tea-tasting party.It contains a set of Chinese gongfu tea ceremony tea wares and 3 units of professional standard tea tasting cup. We also can set the theme according to your requirement. and we provide enought tea samplers to match the theme of a tea tasting party. 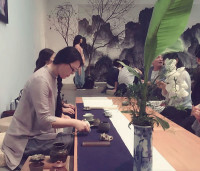 We will direct and guide how to arrange a Chinese tea tasting party, and provide assiance and help you to host a successful Chinese tea tasting party. After getting permission, you should pay before we send the tea-box of tea-tasting party. Part or All of your payment will be returned, according to evaluation of the tea-tasting you have hosted. 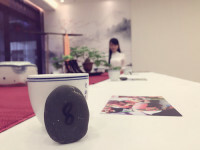 Strong passion and interesting for Chinese tea culture, Pass on the spirit of Tea-Dao to people. 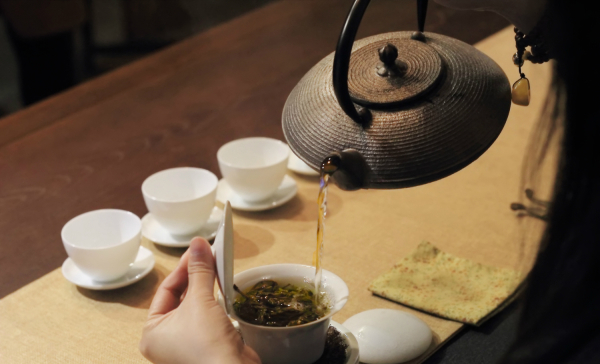 The Dao of Chinese tea stresses the fact of being harmonious, quiet, optimistic and authentic. 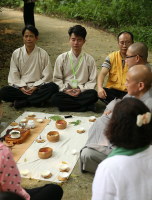 Know and understand basic knowledge of Chinese tea and Chinese tea ceremony. 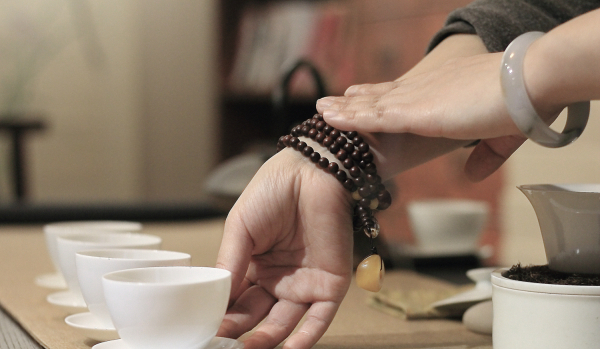 Study how to host a Chinese tea tasting party. you can down guide book at our site. The abilities of Planning and managing a successful tea tasting party. Where will you want to host a tea-tasting party? When will you want to host a tea tasting party? What is your plan to host a tea tasting party? What do you wish we would do for you to host a tea tasting party? The Chinese Tea Ceremony, or Gongfu Cha is an ancient style of carefully, methodically drinking tea with a traditional Chinese tea set. 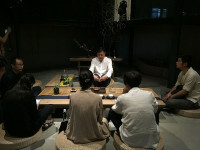 The traditional Gongfu tea set includes a tea table, a teapot or gaiwan, three small tea cups, a set of tea tools to aid in serving, and a kettle. This process is repeated each time the tea is served, and a single serving of tea (3-8 grams) can be reused 4-8 times, until the flavor has faded. Depending on the speed of consumption, the warming steps may be left out if not needed. 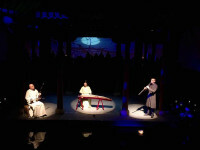 the gongfu tea service developed naturally as a way to get China's myriad of teas just the right flavor. Regardless of the level of showmanship, Gongfu Cha is a beautiful cultural art form that offers tea the respect it deserves. It's also an amazing way to meditate and relax, adding to the already powerful health benefits of tea. Officially, the Gongfu Tea Ceremony is a 21-step process which takes careful practice, hence the name gong-fu, a play on words kung-fu. 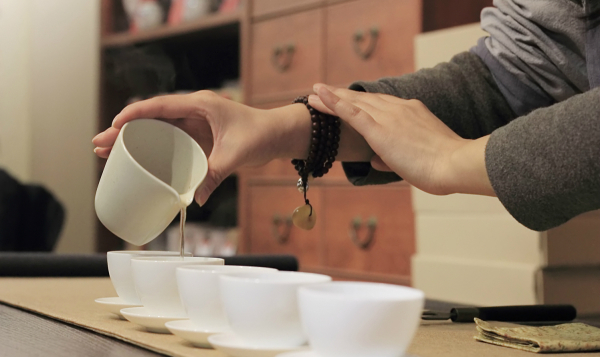 Whenever you visit an authentic Chinese tea shop, they will undoubtedly offer some form of gongfu tea service, often with exaggerated hand motions or entertaining tricks. You’re probably asking yourself – why did I steep double the amount of tea I would normally? The answer: so that your cuppa’ tea “overemphasizes” the flavors hidden in each tea. A full, long steep with double the amount of tea might not be perfectly pleasing to the palate, but it will help to tease out the flavors you might not notice normally, and make them more apparent to your tongue. With that in mind, there are also a few techniques during the actual tasting itself that will help bring out the flavors of the tea and make them more recognizable. Smell: Studies have shown that 80-90% of what we taste is actually due to what we smell. With that in mind, you’ll want to treat your cuppa’ tea just like a glass of wine: take a deep, long inhale as you bring the tea to your mouth, so that the aroma mingles with what you’re tasting on your tongue. Slurp! It may make your tea tasting a bit more rude and noisy, but slurping tea is the only way to truly taste it. Slurping cools the tea, and runs it over your tongue, allowing it to fully touch every part of your palette. And don’t swallow just yet! You’ll want to let the tea sit on your tongue while slightly pulling in air from your lips (cue more slurping sounds), thus aerating the tea and allowing it to fully run over your palette, bringing out the full range of flavor. To drink tea alone can be a wonderful and introspective journey, a meditation on beauty through the synergies of flavor, smell, and taste. To drink tea among friends under the right circumstances magnifies the sensations of the tea, making it easier to see the beauty that tea has to offer. This is possible because as you taste your tea and describe your experience, others can learn from you and look for the sensations you pinpointed. You can do the same by listening to friends describe their experience. Fine tea presents a vast spectrum of sensations, and we are all individually attuned to different elements of flavor, texture and smell based on our past experience. By drinking among friends, you are able to widen the spectrum you perceive and respect the tea more fully. Tea as a beverage was first consumed in China and has played a significant role in Asian culture for centuries as a staple beverage, a curative, and a status symbol; that’s the reason why theories of its origin are often religious or royal in nature.To drink some tea in former China could be considered as a self consideration or an art. It is also a way to better appreciate life. A tea tasting party is a great fun and a way to get to know different types of teas with a group of friends. Host an authentic tea tasting party by involving certain traditional elements, but add your own flair to the event.